New edition for ArcGIS 10.1 provides an easy-to-understand introduction to GIS. Redlands, California—GIS Tutorial 1: Basic Workbook provides an effective introduction to geographic information system (GIS) technology. As the first book in the Esri Press GIS Tutorial series, this popular workbook has been updated for compatibility with ArcGIS 10.1. The book combines ArcGIS tutorials with self-study exercises and guides students through a series of step-by-step exercises to gradually increase their skills and confidence. Students also gain critical-thinking skills as they solve the real-world problems presented in the exercises. Appropriate for self-study or the classroom, the workbook provides a comprehensive range of instruction—from creating maps and collecting data to using geoprocessing tools and data models. The book is generously illustrated throughout with full-color maps and other graphics. The authors, Wilpen L. Gorr and Kristen S. Kurland, developed the workbook through their many years of teaching GIS to students at Carnegie Mellon University in Pittsburgh, Pennsylvania. 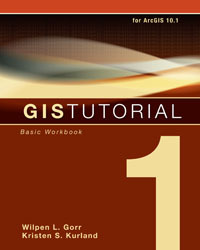 GIS Tutorial 1: Basic Workbook, 10.1 edition, (ISBN: 978-1-58948-335-4, 440 pages, US$79.95) includes data on DVD to complete the exercises and online access to a 180-day software trial of ArcGIS 10.1 for Desktop Advanced. Instructor resources, including lecture slides and solutions for the assignments, are available. The workbook is available at online retailers worldwide, at esri.com/esripress, or by calling 1-800-447-9778. Outside the United States, visit esri.com/esripressorders for complete ordering options. Interested retailers can contact Esri Press book distributor Ingram Publisher Services.